Carnival Cruise Line has unveiled details of a delicious new burger, which will be exclusively available aboard it’s Australian fleet – including Carnival Spirit. The burger sounds so delicious, we felt it only right to share details of its gastronomic magnificence with you. Aptly named the Boomerang Burger, Carnival’s latest culinary offering was created by U.S. chef and Food Network personality Guy Fieri – with additional input from Carnival’s enthusiastic Aussie fans, who gave the burger its all-Australian title via Facebook. The burger will be served in Guy’s Burger Joint – which will feature aboard Carnival Spirit from September 2015 – and is hotly tipped to become a favourite among cruise passengers dining in the new, all-burger venue. Made with cheese, bacon, tomato, grilled onion and Guy’s special tomato relish and aioli burger sauce, we’re sure you’ll agree – the Boomerang Burger sounds mighty tasty. 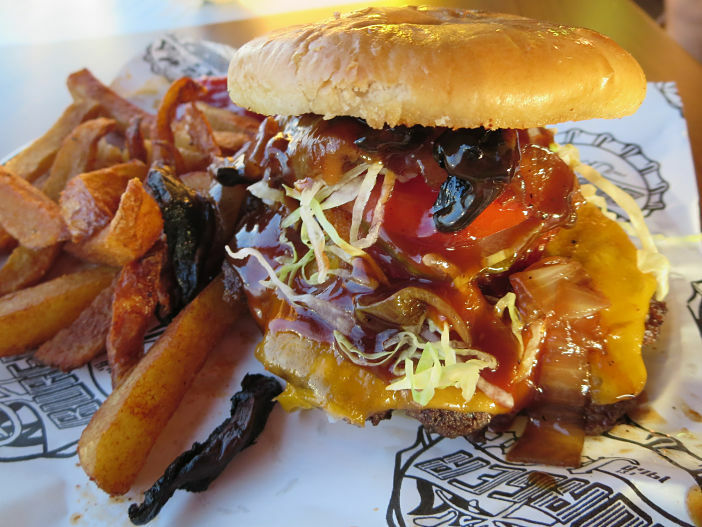 Guy’s Burger Joint is one of seven new bars and eateries that have been added to Carnival Spirit during a US$44 million dry-dock upgrade in Singapore. Carnival hope the new drinking and dining venues available aboard Spirit will entice more Australian cruise-goers to book a cruise in the future. Travel with Carnival Cruises Today! Images sourced via Flickr Creative Commons and GuyFieri.com. Credits: Guy Fieri and TheGirlsNY.